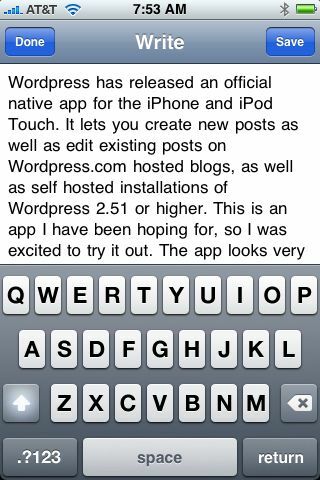 WordPress has released an official native app for the iPhone and iPod Touch. It lets you create new posts as well as edit existing posts on WordPress.com hosted blogs, as well as self hosted installations of WordPress 2.51 or higher. This is an app I have been hoping for, so I was excited to try it out. The app looks very slick so far. I’m going to upload some photos too to test that out too. The auto-correction for the keyboard is disabled in the post title and tag fields, but thankfully it is intact when you are typing up a post’s body. 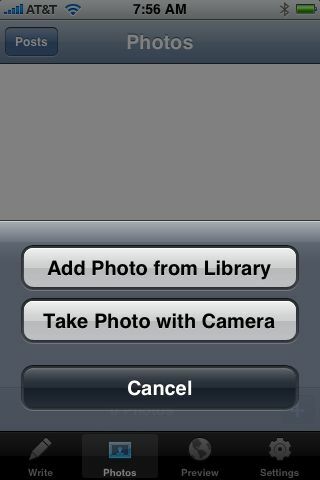 You can post images from photos you have saved on the device (I used it to attach the screenshot). One feature I hope they will add is the ability to moderate comments. I expect that the app will grow to add such features with updates overtime.